Human medical implants keep people alive, but keeping those devices working depends on some kind of power source. Understandably, keeping the power source outside of the body presents logistical problems. Keeping the battery inside the device means that painful procedures are required to remove or replace it. John Rogers of the University of Illinois at Urbana-Champaign has created a battery that is biodegradable and dissolves in the body on its own. The batteries are obviously meant for temporary use since they break down after a time in the patient’s body. They could be used to wirelessly monitor vital signs in a patient following a surgery. 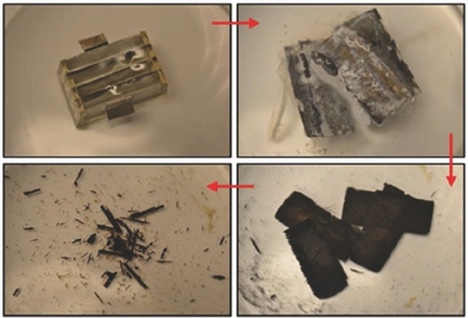 The materials used – biodegradable metal foils and polyanhydride packages – are safe to the human body in small amounts. 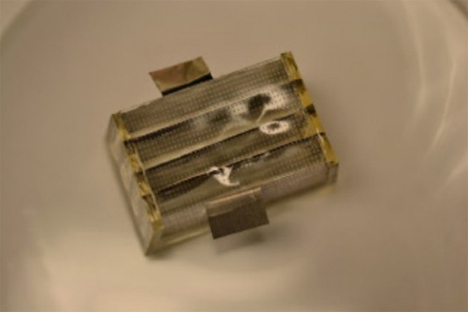 At the time of publication, these batteries are about one square centimeter and provide 2.4 milliamps of energy for one day. The researchers hope that, with time, the size will be reduced by 3/4ths and the power output greatly increased. The batteries could be useful in other applications as well, such as dropping thousands of tiny chemical sensors into an oil slick to help measure environmental impact. After the little robots do their job, they would simply dissolve harmlessly.